I am bored how gloomy is today, just been checking out some clips on YouTube while remoted into someone's slow PC at work. Probably good reason for it being slow though, seeing as how the customer is based in South Africa. Anyway came across the below clip which doesn't allow me to embed it as Nintendo disabled that feature. Obviously to see how many hits that the clip gets and a considerable amount it has received already picking up 25 honors. I am going to add YouTube to my Links section down the right hand as it's all about that site at the moment as they have received enough press this year and well deserved. 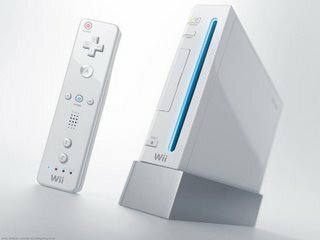 Click the picture below to be redirected to view the footage of the Wii in action. Definitely going to pick one up for me and my children although the way you throw your arms about with the controller I expect many injuries in my busy house haha..
On the subject of new products I came across a review of the so called 'ipod killer' from Microsoft. The Zune does sound well impressive, I haven't spoken to anyone yet that I know across the pond that has one but I came across a review on Engadget. I am on it listening to music too and from work and my ipod is in need of replacing as my music collection has outgrown it considerably. The Zune has caught my attention as I like the ability to be able to share songs wireless and play them three times before deciding whether to get the full version for yourself. The screen is also impressive but saying that Apple are to launch the video ipod soon and this has an even larger screen which is touch screen. Lots to choose from anyway and competition is good as the companies push to make better products which benefits us as the buyer. If you are in the same situation as me in looking for a new music player and would like to know of the other options out there. Check out the review of the Zune over at Engadget that I have linked to and as above with the Wii click on the picture to be redirected to the Zune review. It hasn't received massive appeal but it is early and as with the Xbox, Microsoft are not worried about throwing money at 1.0 as just look at how far they have come with the Xbox 360 ! !